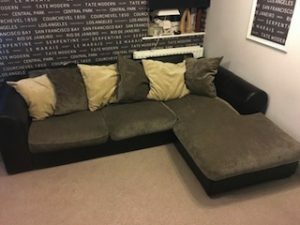 A four seater low back right hand corner sofa, upholstered in black faux leather and grey velour. 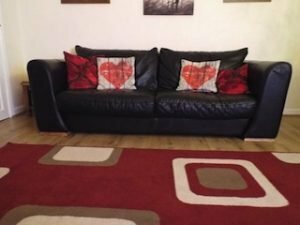 A two seater high back sofa on solid wood feet, upholstered in black faux leather, together with a large patterned red area rug. 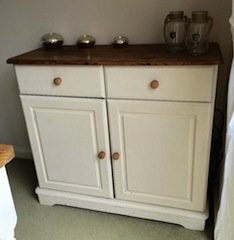 A solid wood hand painted white sideboard in the country style, having two drawers above a double cupboard. 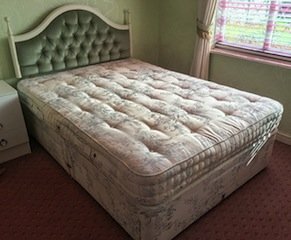 A vintage floral upholstered two drawer double divan bed, together with a matching mattress and a green velour buttoned headboard. 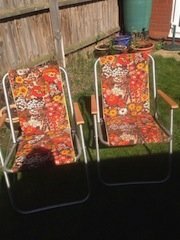 A matching pair of vintage kitsch fold away garden chairs, upholstered in orange and brown floral fabric. A tall standing white Zanussi fridge freezer. 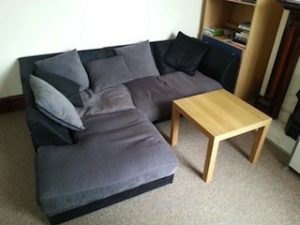 A four seater high back left hand corner sofa, upholstered in grey and black cotton, together with a solid wood square coffee table. 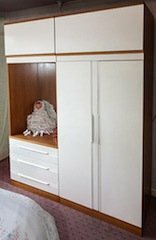 A two piece white solid wood vintage wardrobe, having a double wardrobe, a vanity mirrored back unit above three drawers. 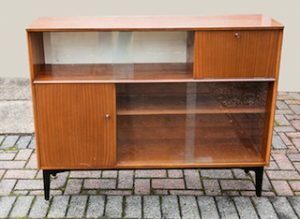 A solid wood retro side unit on a black wood base and brass feet, having two glass sliding cupboards. 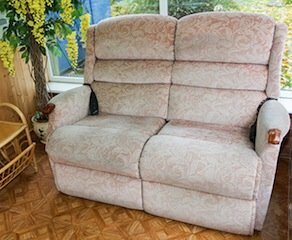 A two seater high back vintage reclining sofa with mahogany arms, upholstered in pink and white floral fabric. 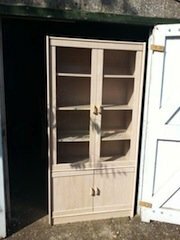 A tall standing solid light wood display cabinet, having two glass inlaid doors opening to reveal three shelves, above a double cupboard. 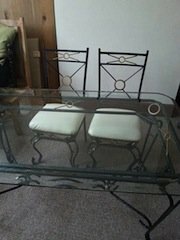 A black cast iron glass topped dining table, together with four high back dining chairs on scroll feet. 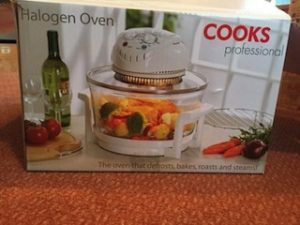 A brand new boxed white and stainless steel Cooks Professional halogen oven. 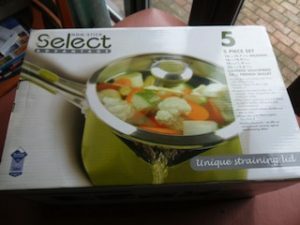 A brand new boxed set of five stainless steel green lidded Select Advantage saucepans. 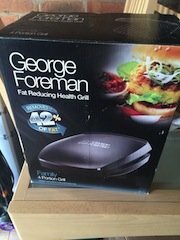 A brand new boxed black and stainless steel George Foreman fat reducing health grill. 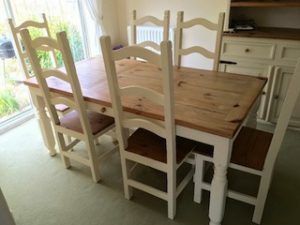 A hand painted white solid pine rectangular dining table, together with six matching high back dining chairs. 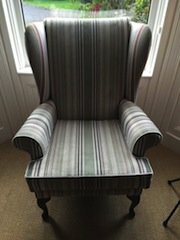 A vintage high back gentleman’s armchair on mahogany legs, upholstered in striped patterned fabric. 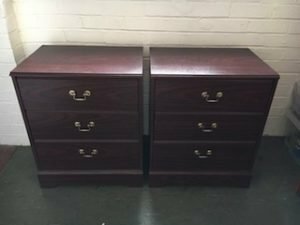 A matching pair of vintage mahogany three drawer bedside units, each having brass handles. 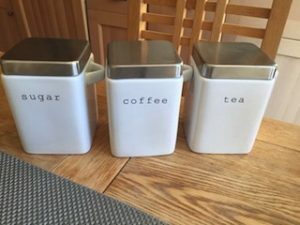 A set of three square white ceramic tea, coffee and sugar canisters with stainless steel lids. 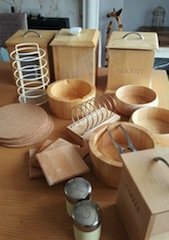 A set of solid wood kitchen accessories, to include a biscuit barrel, tea, coffee and sugar canisters, coasters, salt and pepper shakers etc.